The Lodge Red Silicone is our pick for the best cast iron skillet that measures 12 inches across and it has a stay cool handle that is made out of silicone. It is okay to use on induction cooking stoves and it can be used in sautéing, braising, baking, searing and broiling as well as frying. Our step-up pick is the Lodge Pro-Logic and it also measures 12 inches across and is also pre-seasoned. The handle has a curved design for easier handling and it is compatible with all types of cooking stoves, from induction to gas to electric. It can even be used for ovens and grills. The budget pick is the Home-Complete Pre Seasoned and it provides even heating for your food. It also measures 12 inches across and has been pre-seasoned for your convenience. It is perfect for making your favorite hash browns and searing foods due to the 2-inch depth. The skillet is an important piece of cooking equipment in the kitchen. It is an indispensable tool that can be used for eggs and many more. It is different from a regular frying pan because of its ability to cook larger heaps of food in one go and are mostly used for camping and the like. They also tend to be more durable than the ones you see in the market because they are built to last for years. They are mainly used to cook flat food, such as eggs and the like. Aside from the frying pan, this kind of pan can also help to cook larger batches of omelets, fish, sausages, hotdogs and the like. You can also put it in the oven without the worry of melting any of the nonstick material because you only need to pre-season it for it to be a nonstick cooking tool. They are usually made of either cast iron or any other material but with nonstick coating. The most possible one that you will encounter is made out of cast iron, as the other materials are the ones that are mainly used for the frying pans, sauce pans and other indoor kitchen tools. The skillet is mostly an outdoor tool or an oven tool because of its ability to withstand Dutch ovens, large ovens, outdoor cooking, camping grills and the like. Cast iron is usually a preferred cooking tool for camping and for healthy cooking. Most people use them with their cast iron material due to the less likelihood of chemicals getting into your food as compared to those that are using synthetic nonstick coatings. If you are not that good with Teflon-related cooking items or any other nonstick cookware, you can use the cast iron pan instead because of its usefulness and healthier cooking options. They are different from sauté pans, which are basically made for sautéing food instead of frying them. This kind of pan is also different from the frying pan because of its additional holder or handle on the other side, other than the holding handle that is elongated. The base is usually more chiseled than that of a sauce pan, which is usually flat and more ideal for soups and similar stewing dishes. They can also be different from a wok, which is mainly used for stir-fry noodles, rice, veggies and the like. The wok is also a lot bigger and usually do not have a lid. They also tend to have shorter handles, whereas this kind of pan can have a much longer handle and can have an additional handle so it is a lot safer to handle for beginners. The wok is mostly used in restaurants and for large dining parties. Unlike regular nonstick pans, they need to be seasoned properly if you want them to be nonstick. 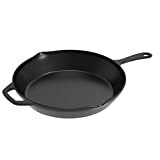 Compared to your regular household Teflon frying pan or nonstick pan, the nonstick quality of the cast iron pan depends on whether it was pre-seasoned properly or not, or you have to pre-season it yourself. Size of the cooking area: this refers to the size of the cooking area by which you are going to cook with your pan. They can be as small as 6 inches and can also be as big as 12 inches, so you have a size for different kinds of foods. Smaller ones are the most ideal ones to take for camping to reduce on backpacking problems, while the bigger ones are for family camping and celebrations, or for simply cooking everyday meals for a large family or audience on a daily basis. Stove compatibility: you need to consider whether it is compatible with your stove type. You can have various kinds of stoves, such as the gas stovetop, the electric stovetop and of course the newest induction stovetop. Make sure that it is appropriately designed for your specific stove so that you do not ruin both your stove and your cooking item. Quality of the cast iron: you need to know if the quality of the cast iron is okay and acceptable for your daily needs. Having been properly sealed and made with quality materials is important so that it does not fail you when you are cooking your food, and also so that it will not contaminate your food. Ease of seasoning: most that you can find in the market nowadays have already been pre-seasoned, so you can just use them right away. However, they need to be properly seasoned so that they can be used for a longer period of time, so it is important to find one that is easy to pre-season by yourself. Weight and ease of carrying: it is no use carrying a very bulky cooking tool, especially if you are just going to cook a bunch of eggs for breakfast. You need something that is very easy to handle and also something that does not pack a lot of weight so that it will be easy to clean and carry altogether. PFOA-free: consider one that does not contain harsh chemicals such as PFOA that may get into your food. Additionally, some are also PTFE-free so you should consider those as well, as they make your food less likely to have the harsh chemicals. Lid or no lid: while skillets don't usually have lids (those are for sauce pans), some special ones do have a lid. There are special ones that you can use for cooking specific foods that require any cast iron material but needs to have a lid over it so that it will not lose its heat and cooking efficiency. Stay-cool handle: this is always an important feature when you are choosing the right cooking tool because it makes things a lot easier for you. Imagine having to handle a really hot handle – it can be uncomfortable at times, so it is much better if you have something that has a stay-cool handle, yet is durable and will not easily break down. Ease of cleaning: consider one that is very simple to maintain and to clean up. You can also choose ones that are dishwasher safe so that you can easily pop them into the dishwasher when you barely have the time to clean them up. As our top pick, the Lodge Red Silicone measures 12 inches and provides the most even heating possible with any kind of pan. It can last for decades if you take care of it properly. You can even use it on induction stoves due to its great compatibility. It can be used for grills, ovens and even on a campfire, and it can be used for recipes that require braising, sautéing, frying, baking, grilling, searing, broiling and others. You can just easily rub it with cooking oil to season it or clean it up. While not a big deal breaker, the Lodge Red Silicone can be a bit too bulky to carry for some people, but that is given with most cast iron skillets anyway. The Lodge Pro-Logic is our step-up pick, which also measures a total of 12 inches across. It can be great for roasting vegetables as well as for summer camping with barbecues, chicken and other meat products. It can be used over the grill or in the oven. Any stovetop type can accommodate this kind of pan, whether you have a gas, induction, electric or glass stove top. The sloped lines make it aesthetic looking while the pre-seasoning makes it almost ready to use as well. The handle is also ergonomically shaped for easy cooking. The Home-Complete Pre Seasoned is our budget pick and can be used for preparing veggie recipes, steaks and the like. It can also be used for camping as well as baking stuff in an oven. You can use it for induction stoves because of its wide compatibility. You can make a variety of dish types such as casseroles, hash browns, chicken, meat, fish, eggs and the like from this kind of pan. It measures 12 inches in width and also stands 2 inches deep. It is backed by a limited manufacturer’s warranty of 10 years. The Universal Housewares Pre-Seasoned measures 10 inches across but there are also 6-nch and 7-inch versions of it. The pre-seasoning makes it much more longer lasting and it also comes with two other pans in the set for you to use in smaller types of food. For the larger families, the 16-inch Bayou Classic is a good choice. You can bake, sauté, fry and make breakfast easily with this kind of pan. The heat transfer is really good and it has also been pre-seasoned so it is almost ready to use and has a smooth texture over and underneath. For those who are cooking solo or for small families, the 8-inch and small Cuisinel Pre Seasoned is good for sautéing, braising, grilling, baking, broiling and frying and can be used for various food types, such as meats, vegetables and the like. It can be easily pre-seasoned and it has a 1-year warranty. The Victoria Cast Iron has a curved handle and has a 12-inch diameter across. It is nearly ready to cook due to the pre-seasoning. It has a smooth finish and has a long handle as well. It can be used for induction cooking and can be used for sautéing, frying and grilling foods. With a deep height of 3 inches, the Lodge L8DSK3 is a great choice for those who want to cook sauces as well as vegetables in it. You can use it for various food types and it can be easily cleaned by hand washing. The T-fal E83407 is a great choice for baking in ovens with its 12-inch profile, as well as for sautéing and searing. The handle is also pretty long and it can take as much as 600 degrees in the oven due to its durability. The Lodge Logic is a great choice if you want a square shaped one instead of a round one. It measures 10 1/2 inches and has been pre-seasoned and almost ready to use. It can also be used for stir frying and has a uniquely shaped handle that is curved and durable. Sadly, the other cast irons were not in this list because they were kind of bulky to carry, not very simple to season and were also not that durable in terms of its cast iron quality and its nonstick capability. It is important for any kind of cast iron material to be of quality to withstand years of usage. Q: What are the main benefits of using cast iron? The non stick material is natural and usually PFOA-free. Without the chemicals that are harmful for your health, you are better off using this kind of nonstick cookware rather than the commercially advertised ones that are usually much more expensive. The non stick material can be easily seasoned when needed compared to commercial ones where if you ruin the seasoning, you’re done for. Having a healthy cooking routine is important for yourself and for your family, hence non stick material should be healthy. They can be cleaned in a breeze if they are properly seasoned, and even without a dishwasher. Rinsing any nonstick cookware in the sink, especially in running water and right after you have used it, is so much easier than having to wait in the dishwasher and have your coating or seasoning potentially ruined. While they should not be soaked in cold water so as not to rust, they can be cleaned in an easy way because they are seasoned. It can be a good source of iron for those who have iron deficiency, especially expecting mothers. Iron deficiency is a problem for most people, and adding iron to your diet because of the absorption from food items such as tomato sauces and the like can actually add some iron to your foods. While it is not really a big amount (see later questions below), it can help you to less likely to faint and get tired easily. They are usually cheaper than a regular frying pan, going as low as $5 if you go to a discount store. Compared to all other cookware that are available in the stores and in the malls out there, they are the absolute cheapest of all because of how they are made. Despite this, they are super durable and it only takes some seasoning for them to last much longer and to be reusable. Durability is without question when it comes down to these cookware. Like we mentioned below, it gets better the longer it is used, much like wine that is stored in a wine cellar. When it comes down to durability, nothing beats this kind of material due to its great melting point compared to others likes stainless steel, aluminum and the like. While they tend to be heavy, they can last for decades. The temperature when you cook is distributed evenly, resulting in less burnt parts of your chicken. If you want to cook fried chicken for the kids but you can’t watch over it all the time, you are better off getting this kind of pan because it is much better with its heat retention and even cooking temperatures. Q: Is it possible to put it in your oven? A: Yes, most of them have been designed specifically for oven use. They are much better when it comes down to heat retention so they are your best choice if you need to bake stuff in a Dutch oven or any large oven for that matter because they can evenly heat your food regardless of where you cook them on and what food you cook. Q: What food items can I cook in this kind of cookware? 1. Chicken – you can definitely make the good old fried chicken with this kind of cookware because of its ease of use, larger room for frying and better chances of not getting a brown or overcooked burnt part, which tends to happen in a regular pan. 2. Pizza – one of the most common things that this kind of cookware is used for is basically for homemade pizza, or for your own business. Depending on the size of the pan that you have, you can make your very own recipe for pizza without having to use your pizza pan. 3. Korean Bibimbap – this is slowly rising as one of the most requested Korean dishes or casseroles around, because of its assortment of food items, such as eggs, veggies, sauce, meat and the like, all in a single rice bowl – kind of like the assorted Chinese Lauriat or those Japanese donburi or rice bowls. 4. Panini – aside from pizzas, you can also make Panini sandwiches with this kind of cookware, especially for those who don’t really have a lot of room for the size of their cookware, which can be just right for most small sandwiches. 5. Oatmeal – surprisingly, you can also cook oats in this kind of cookware because of its ability to caramelize stuff as you go. They can be great for browning food items as well so oatmeal is a great dish to have for this kind of cookware. 6. Crepes – those really thin pancakes can benefit from the expertise of a cast iron pan, which makes them a lot easier to cook evenly without burnt areas, albeit the flipping is kind of difficult since the pan is quite heavier than your usual frying pan. 7. S’mores – these dessert treats that are made of graham crackers, marshmallows and chocolates, can be a great recipe for this kind of cookware. The pan can help them distribute heat evenly without being too much on certain spots. You can use it underneath your own broiler. 8. Lasagna – nothing beats homemade lasagna if you have an oven. Lasagna can have different types of noodles as well, other than the sauce and the cheese. It is one of the most common baking recipes you can find with this kind of pan. 9. Tortillas – especially the Spanish tortilla, this is basically a potato omelet or frittata in which potatoes are inside your omelet. They are a great recipe to have if you’re an egg person and a potato person but don’t want a sunny side up (because your nonstick frying pan can do that, anyway). 10. Dutch Baby Pancakes – these special pancakes are the best for this kind of pan due to the caramelizing of the apples, which are important for this recipe. They are a must-have if you want to cook something sweet for dinner. Q: How does cast iron cookware compare with regular nonstick ones? Cast iron tends to be heavier than your regular non stick pan. They tend to be smaller in size and in weight because of their material. The heat resistance is very good compared to regular non stick, so it will be much better for searing and broiling your food items. They may not be ideal for broiling and searing due to the low heat resistance. The non stick quality is natural and will not harm your health. There are some nonstick coatings that can go off easily and possibly contaminate your food. You can actually have more iron in your diet with this kind of pan, because iron is good for maintaining a good blood pressure. It does not contain iron, so it is less healthier for your food and for your well-being. They tend to be more durable for the years to come because they are far more quality made than regular pans. Some of them can last for years, but not all of them can withstand as much usage as cast iron. The weight of this kind of pan is usually bulky, since it is of heavy duty, so you can’t flip eggs or pancakes. Flipping food items is easier because they are usually more lightweight. While some are dishwasher-safe, it is much more recommended to wash them manually. They can also be dishwasher-safe at some point, but all nonstick cookware needs to be manually washed. You only have the blackness of iron to choose from. You get a lot of colors to choose from to complement your kitchen. Q: How is it different from a sauté pan? They tend to have less of a surface area due to the slanted sides. They tend to have more surface area because of the straight sides. They are meant mostly for frying and quick cooking food items. They are mostly made for making sauces, searing meat and the like. They tend to have no lid, while some cast irons do have a lid. They will always have a clear lid to cover your food. This tends to be more versatile due to the sloped sides. There’s somewhat of a limited amount of food items that you can cook here. Q: Is there a difference between a skillet and a frying pan? They tend to be larger in size compared to the frying pan. They tend to be smaller and are meant for smaller kitchens as well. They are mostly best used for roasting, frittatas as well as some stews. However, they can also be good for frying, such as with fried chicken. They tend to be best used for browning food items as well as for searing and frying. Cast iron is the most popular type of material for this kind of cookware. They can be made out of different materials, such as stainless steel, aluminum, copper or even ceramic. The usual depth is about 2 inches as it is made similar to that of a sauce pan. It is usually more shallow in terms of height and its handle is usually longer. Q: What is the proper way of measuring the length of this kind of cookware? 1. Get a tape measure or ruler. 2. Prepare the pan that you are going to measure. 3. Start from one edge on the top of the pan and begin your measurement. 4. End the measurement on the top of the pan on the final edge of the top. 5. Write the number down and remember it for future references. Q: What sizes can be available out there for this kind of pan? Q: How do I clean this kind of pan? 1. Clean it right away after you have finished cooking with it and don’t sink it in water too much. If you sink it in water then it might potentially get corrosion because of too much soaking. 2. Use warm or hot water when you clean it, with the use of a stiff brush or sponge. The hot water can prevent it from getting corrosion so that it will be usable for a longer period of time. 3. Don’t use harsh cleaning utensils such as steel wool and harsh abrasives like soaps and dishwashers. The harsh cleaning utensils can make the coating get removed easily. Consider only using steel wool if it is rusty, and only for the outside part, if possible. 4. Kosher salt or boiling water will help to remove food residue that is stuck onto the pan. Either of these can be great in taking out the residue, so that you do not have to scrub it with any abrasive cleaning tool that can potentially damage the coating. 5. Vegetable oil can be used to coat the outside and the inside of the pan so that it will look good and be much more protected against the elements. You can use various oils as well, such as flaxseed or linseed oil, olive oil or any kind of oil that you have used for seasoning it. 6. Make sure that the pan is kept in a place that is dry and without much humidity to avoid rusting. Any humid or damp location is bound for corrosion, so it is important that the pan stays as dry as possible. 7. If ever you accidentally ruin the seasoning by scrubbing too much because of stuck on food, you can just re-season it. Re-seasoning is a lot easier than having to buy another pan, which is the case if your pan is not cast iron. 8. If rust ever forms onto the pan then consider using steel wool as well as baking soda and raw potato for cleaning it and then re-season it afterwards. Q: How do I season it properly? 1) Using hot and soapy water, you should clean up your pan thoroughly. 2) Let it dry as much as possible by wiping gently on all sides. 3) Prepare vegetable oil or melted shortening and spread it onto the pan’s surface. 4) Prepare your oven’s middle rack and put your pan downwards. 5) Put a foil onto the bottom rack so that the drips will not make the oven messy. 6) Set the oven up to 375 degrees. 7) Bake the pan for up to 1 hour. 8) Let the pan cool while it is still in the oven before taking it out. Q: How do I test the temperature of this kind of cookware? 1. Prepare a piece of white paper that’s small enough to fit in the cookware. 2. Drop it in your pan when you are currently trying to heat it up. Q: What are the misconceptions of this kind of cookware? They should not be cooked with tomatoes and tomato recipes, or anything that is acidic. You can actually cook your favorite tomato sauce if you have a properly seasoned pan that can take citrus fruits, juices and basically everything with ascorbic acid. For safety purposes, make sure it is fully seasoned so as not to make your food taste like metal later on. It’s nonstick, so metal utensils are a no-no when cooking. Not entirely true, as compared to Teflon and other nonstick cookware. This kind of pan can be easily repaired while it is cooking, and you are not necessarily chipping off the nonstick coating you’ve used in seasoning, but just some random oils that have been left from the last cooking activity. It gives you a lot of nutritional iron on a daily basis. It depends on how much you cook and what you cook. For instance, if you cook tomato recipes longer, the iron is absorbed much more for your food. If your pan gets corrosion then you cannot use it anymore. Not really, since any rusted pan can be cleaned with the use of restoration tools such as steel wool and the like. You won’t be able to use your pan anymore if you clean it with soap. It only removes the seasoning but will most not certainly completely render your pan useless. It will only require you to re-season it again. To prevent this from happening, use mild soap that is okay for your pan as per cleaning instructions. Q: What are things you should never cook in it? a) Tomato sauce – this can potentially damage the seasoning of your pan, but it depends on whether it is properly seasoned. However, in most cases, it is usually much better to stick to your regular stainless steel pan instead of this kind of pan due to its acidic disadvantages. If you pan is not properly seasoned then it can leave a metallic aftertaste on your pasta or sauced food. b) Certain desserts – while it can be tempting to make cakes onto the pan that you also cook your fried chicken on, you shouldn’t because, well, your cake might taste salty, or something. The flavors that are in your fried chicken will basically transfer to your quick bread or homemade pie, cakes and the like, which isn’t really something pleasant. Solution: get yourself a separate pan for the baking process. c) Meat recipes that are soaked in wine – because wine might contain some acidity, like tomato sauce, it can be bad for a pan that is not properly seasoned, and it will also taste metal-like instead of tasting like beef or chicken, and of course, it can be bad for your well-being. Anything that prompts you to deglaze is better off in another type of cookware, such as ceramic. d) Certain fish – if you want to cook stuff like cod, tilapia and flounder, these fish can stick like glue to the pan, which is pretty ugly. The solution: use enamel pans instead so that you don’t have to ruin your seasoning to the pan. e) Omelets – not necessarily a no-no unless your pan is super-ultra-mega seasoned, much like with tomato sauce. If you really want to cook omelets so badly in this kind of pan then the seasoning should be full as well. Otherwise, scraping the egg bits can be a pain and can kill a lot of time. Enamel pans are better for omelets. Q: Should I cook with a pre-seasoned pan right away? 1) Get it out of the box. 2) Wash it thoroughly and then let it dry. 3) Add a light coat of oil for seasoning, just to make sure. 4) Make sure that all of the areas are properly filled with just the right amount of oil. 5) Heat it up on your stove or oven. 6) Cool down the pan and repeat as needed. Q: What is the highest temperature that I can use this kind of pan material for? A: The usual temperature capacity of this kind of cookware is the highest of all cookware because of its durability. The max temperature for most ovens is up to 400 to 500 degrees, while iron might start to deteriorate at over 700 degrees, and will melt at a super high temperature of 2,200 degrees, so you don’t need to worry about it burning in the oven. 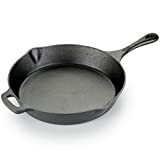 Q: What are some good fats that I can use for seasoning this kind of pan? a) mineral oil – they can be found on most supermarkets and stores. b) flaxseed or linseed oil – they are available in most countries. c) coconut oil – they are available in mostly tropical countries. d) olive oil – they are also another healthy option. e) ghee (clarified butter) – this is your option if you don’t like butter. f) butter – this is your option if butter is all you have. g) lard – this can be an alternative to butter. Q: What is the average lifespan of this kind of pan? A: This kind of iron cookware is actually much more longer lasting than other cookware because just like wine, it gets better the longer it is used. In fact, your pan is probably from your grandma or great grandma because of its longevity that is not seen on other cookware. All you need to do is to cook it with proper seasoning so as not to make the food get stuck on the surface of the pan. Q: Why is it bad to store foods in your pan? a) It might leave a metallic taste on your food, especially if it is acidic like tomatoes. b) It will also make the pan seasoning break down faster. c) Not related to iron but, since most pans are not covered, they can get cold easily eventually. Q: How do I know when I need to re-season my pan? 1) Your pan gets blotchy in its appearance. 2) Your pan gets some corrosion in its parts. 3) It appears duller than ever before. 4) It could have some gray areas. 5) It’s harder to get your food out on most parts of the pan. Q: How do I properly store and stack these pans? 1) Make sure the place is dry enough so as not to cause corrosion. 2) Use a towel between the two pans so that the seasoning will not be ruined as well. 3) Repeat with more towels as needed depending on how many pans you have at home. In the long run, the Lodge Red Silicone is our pick for the best cast iron skillet that can be used for baking, sautéing, frying and broiling and it can be used on induction cookers. The size is just right and the handle is easy to hold.